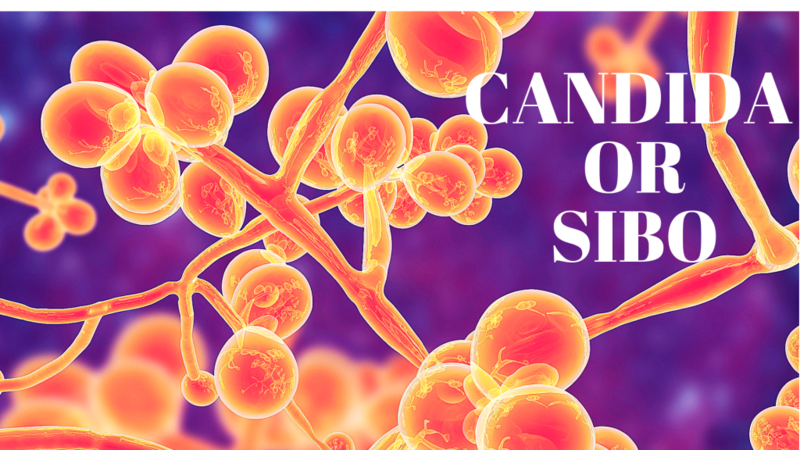 Candida or SIBO? Which one do you have? Which one needs to be addressed? Could it be both? Are they each a result of other imbalances in the body? Are those the same imbalance or different imbalances? Candida is primarily a result of the imbalances created by antibiotic use. It normally occurs as a yeast that is common to most, if not all people. When the body is exposed to antibiotics, candida transform from its beneficial yeast form to its problematic, fungal form. With the introduction of the SIBO term, in the 1990s, some people began to refer to candida as SIFO (Small Intestine Fungal Overgrowth). SIFO however, is misleading, as fungal candida grows and spreads throughout the entire body. With recent findings of bacterial communities growing throughout the body, SIFO may also be an inaccurate description, as candida could start anywhere in the body that antibiotics are introduced. Candida is associated with causing or contributing to over 125 various diseases and conditions. It drives a lot of inflammation in the body and inflammation promotes fungal growth. It plays a role in regulating the composition of the bacterial flora throughout the body, as well as modulating the function of the immune system. Research shows that fungal candida starts to occur as soon as antibiotic use begins. It only takes 5-48 hours to establish systemic fungal candida infections. The research on candida began in the mid-1040s when antibiotics were first introduced. On PubMed, the U.S. National Library of Medicine and National Institutes of Health’s website for all research studies, there are 66,000+ studies on candida with an average of 7.5 studies every day. Compare that to SIBO, which only has 410 studies with an average of 2 studies every month since the early 90s. SIBO is the abbreviated name for Small Intestine Bacterial Overgrowth. Although the meaning of the term continues to evolve and change, it considered to be a condition that occurs when bacteria that grow in other parts of the gut start growing in the small intestine. Why and how this happens is rarely addressed or understood. SIBO is currently believed to be caused by many conditions which just so happen to be strongly associated with antibiotic use and and subsequent fungal candida. These ’causes’ for SIBO, would more accurately be described as associations. These include antibiotics, low stomach acid, Irritable Bowel Syndrome (IBS), Celiac Disease, Crohn’s, diabetes, liver cirrhosis, etc. This list matches exactly the list of diseases associated with antibiotics and fungal candida. Candida and SIBO both find a very common origin in antibiotic use. The imbalances created by antibiotic use can last a lifetime. A 5 to 7-day course of antibiotics wipes out all the bacteria in the body and it can take 9 to 12 months or more for the bacteria to be restored, but some species don’t return. Fungal candida plays a strong regulatory role in preventing some species of bacteria from returning. Not only does this change the ratios of bacteria, but it changes the amounts and the overall function of many systems in the body. This restructuring of the intestinal microbiome is permanent until it is reset. It can’t be reset unless fungal candida is addressed. Each successive course of antibiotics strips away more and more numbers and species of bacteria. This leads to further imbalances and allows certain species to overgrow beyond their normal levels until they create an overall state of imbalance in the gut and throughout the body. Together with antibiotics, fungal candida creates SIBO, which incidentally used to be known as Dysbiosis. It used to be that this alteration in bacterial flora was known simply as dysbiosis. Using PubMed as a reference source, we see that dysbiosis has 4,465+ studies dating back to the 1950s, verses the 410 studies on SIBO dating to the 1990s. SIBO in every way is simply dysbiosis repackaged as a new condition. From the medical standpoint, the only tools available to treat the overgrowth of bacteria is actually the same tool that created the problems in the first place. If one looks for the standard medical approach in both SIBO and Dysbiosis, it is antibiotics. Using the same substance that created the problem doesn’t seem like an intelligent choice, but when it’s the only option available to MDs, it’s always used, regardless. The gut flora needs to be reset by first addressing fungal candida and the immune system imbalances that result from it overgrowing in the gut and throughout the body. Once candida has been addressed, then the process of resetting and restoring healthy gut flora can begin. One of the most important bacterial species to restore is Lactobacillus acidophilus. Fungal candida prevents this from recolonizing the gut, so fungal candida needs to be addressed first. If this is not done, then results will be short-lived. Whether you have candida or SIBO, or even have both, the underlying imbalance of bacterial flora and immune system dysregulation creates the opportunity for these imbalances to occur. Using science, we can best guide ourselves on how to bring everything back into balance. I’ve been treating candida for over 34 years and find that addressing fungal candida is the necessary first step in correcting any and every imbalance of the gut flora. Unfortunately, there is so much misinformation on the Internet today, that many people are misinformed about simple science and either follow bad advice or pass it along to others. If you’re feeling lost on this path, we’re to help provide sound answers that lead to a safe and successful resolution of complex issues.